The Golden State Warriors suffered a surprising loss in Game 2 of their first-round series with the Los Angeles Clippers, but they have since bounced back in a big way and now find themselves one win away from advancing to the second round of the Western Conference playoffs. Game 4 on Sunday afternoon wasn't easy, but the Clippers' hard work couldn't make up for the gap in talent, and the Warriors held on for a 113-105 win. 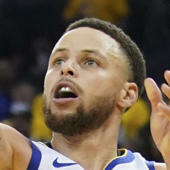 While Stephen Curry struggled to find his touch from the perimeter, Klay Thompson was feeling it in a big way as he poured in 32 points to go along with Kevin Durant's 33 points to help lead the Warriors to a victory and a 3-1 lead over their Pacific Division rival in their best-of-seven series.